My county is poor and remote. Fracking companies think they can abuse it by dumping their fracking waste there. We hold the unfortunate distinction of being the poorest county in the state: an area that is both stunning -- with rolling hills, rocky cliffs, pastures, and ravines -- and inaccessible, far from industry. It's here, at the Hazel Ginsburg well, that fracking companies dump their waste. Trucks ship that sludge of toxic chemicals and undrinkable water across the country and inject it into my county's forgotten ground. That kind of abuse continues. It's just changed shape. The Ginsburg well has a long history of violations, so many that the Ohio Department of Natural Resources ordered it shut. It's a pit well, which looks like an old swimming pool, covered by a tarp. No sign indicates the presence of chemicals, just a “no trespassing” sign. Allegedly, a guard will snap your picture if you stop or turn your car around. The well is located in a residential area, with houses -- some with swing sets -- just down the road. In 2012, Madeline ffitch (whose last name is spelled lowercase and with the double ff) was arrested there. Her arrest was part of an action by a local anti-fracking group, Appalachia Resist. The then 31-year-old's arms were locked into cement-filled plastic drums just before the gates, blocking the entrance. It's hard to get answers about what it's in that waste. But Jason Tremby, an engineering professor at Ohio University, is leading a local team to “clean” fracking wastewater using ultraviolet light, water softening techniques, and a high pressure reactor. It makes sense to me that a solution to the wells might come not from outside, but from people like ffitch, Hughes, and Trembly, working and living in Appalachia. People are used to doing things for themselves here -- and used to the community helping the community. I keep hoping more will be done to protect this place. “You want to forget it,” begins the Appalachian-born Ruth Stone's poem “Garbage.” But the fracking waste in the injection wells of Appalachia can't be forgotten forever. It'll bubble up, one way or another, before long. Alison Stine's most recent book is a novella, The Protectors. A longer version of this piece was produced by the Economic Hardship Reporting Project and The Guardian. Distributed by OtherWords.org. 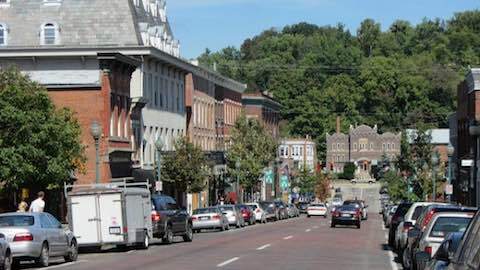 Environment: "America Dumps Its Fracking Waste in My Ohio Town"